Ponying up $500,000 won’t just get you in on a great financing opportunity; it could also get you a green card. In 1990, Congress created the Immigrant Investor Program, known as “EB-5,” to stimulate the U.S. economy through job creation and capital investment by foreign investors. Under this program, individuals must be willing to commit an investment of at least $500,000 to a new commercial enterprise that will create 10 new, full-time positions in the United States. In return, these investors will be eligible to apply for an immigrant visa. Basically, this program offers investors green cards in exchange for cash. Each year, 10,000 immigrant visas are available for permanent residence based on the investor’s involvement in the new commercial enterprise. Investors don’t necessarily have to be full-time partners, either — limited partnership still allows eligibility. Lately, the U.S. real estate market has become quite a comfortable place for people from around the world to invest. EB-5 allows those investors to take advantage of that market while also obtaining citizenship. China has been the top market for EB-5 since 2009 because of the attractive opportunities in the U.S.
“A green card offers a way to send their children to college, escape the heavy pollution and enjoy an improved quality of life,” explains Kate Kalmykov, an attorney with Greenberg Traurig. Now, in 1994, Congress created what are known as regional centers in order to promoteeconomic growth through increased export sales, improve regional productivity, create new jobs, and increase capital investment. The number of regional centers has expanded to more than 100 in the last few years. Developers can count indirect and induced employment opportunities in meeting the requirement of ten jobs per investment. A particular project may be pre-approved by United States Citizenship and Immigration Services (USCIS). Regional center certification provides a worth of legitimacy or endorsement that may help in marketing to foreign investors. Certification may take from four months up to a year. Certification is no longer a small, privileged group. More than 100 centers have been certified. There are ongoing administrative and filing requirements with USCIS in order to avoid de-certification. 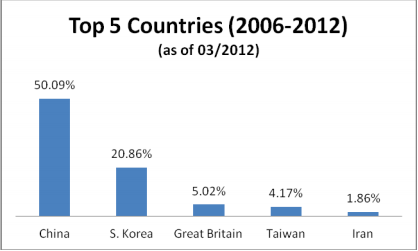 The top markets in EB-5 as of 2012 were China, South Korea, Great Britain, Taiwan, and Iran. 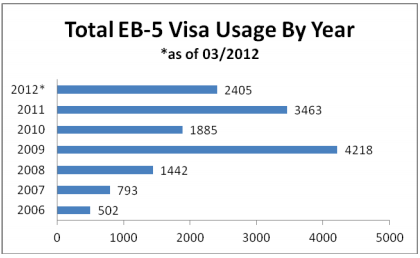 Total EB-5 usage information is only available through March 2012, as the numbers since that date have not yet been published. But 2012 was tracking well above all other years, and all indicators show 2013 to have grown far past those numbers, with growth still trending up. EB-5 has also attracted the interest of commercial real estate developers. Many of these developers see the program as a new financing tool with the bonus of added sales. They could, for example, create a regional center based around specific jobs related to the actual development project. For instance, when a hotel is built, jobs are needed. Filling the jobs allows the immigrant to purchase a visa, which, in turn, makes things easier for the developer. Offering $500,000 certificates based on an investment in condos in the development allows the developer to obtain basically free financing. As an added bonus, the developer also has the option to apply the new $500,000 later on in the process to actual finished condo sales. Many times, the deal allows the immigrant to get the $500,000 back through a five-year program, as it is technically an investment. Even though the ROI will be little to zero, the immigrant will receive a visa and often have his money returned. Banks haven’t been lending as easily since the recession, and in today’s world of financing, developers are finding this program quite attractive. It’s low-cost money, and it’s easy to obtain, creating a healthy platform for many developers. As the investor, you have the privilege of viewing these projects from the developer’s side, whether that is through the EB-5 center or simply through buying a condo in an EB-5-funded building. After all, it’s probably worth taking a look at the developer that went through the process of accessing this program and the cash for funding. When you combine this with who is driving the global real estate market (China, for example), you may find that vacant real estate funded by this vehicle is actually hard to find, as it is often purchased quickly. The limited use of and worldwide demand for this program creates the magical supply and demand factor we all look for in the real estate market.